Over the past few years, a number of political forums and parties have experimented with uniting Dalits and Muslims, given their shared history of being India’s marginalised and downtrodden communities. This begs an important question: did Dalit-Muslim unity ever materialise outside parliamentary politics and if yes, then when? The answer lies in the 1850s when the first chapter of Dalit-Muslim unity was written by Jyotiba and Savitribai Phule along with Fatima Sheikh, who took charge of spreading education among the downtrodden communities. While Jyotiba and Savitribai Phule started teaching women and those from the oppressed castes, they were threatened by the locals. Their families were targeted too and were given the choice of either stopping all their activities or leaving their home. They obviously chose the latter. Neither their caste nor their family and community members stood for what they fought for. Abandoned by everyone around, the duo searched for shelter to live in and to fulfill their educational dreams for the oppressed section of the society. During their search, they came across a Muslim man Usman Sheikh, who was living in Ganj Peth of Pune (then known as Poona). Usman Sheikh offered his home to the Phule couple and agreed to run a school in the premises. In 1848, a school was opened in the house of Usman Sheikh and her sister Fatima Shiekh. It was no surprise that almost everyone from the upper caste of Poona was against the practices of Jyotiba and Savitribai, and there were even attempts to murder Jyotiba. It was Fatima Sheikh who helped and supported their cause in every possible manner. Fatima Sheikh started teaching in the same school with Savitribai Phule. 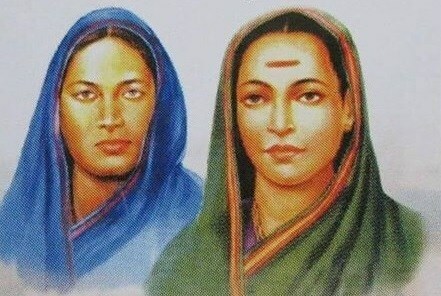 Savitribai and Fatima were accompanied by Saguna Bai, who later became another leader in the education movement. 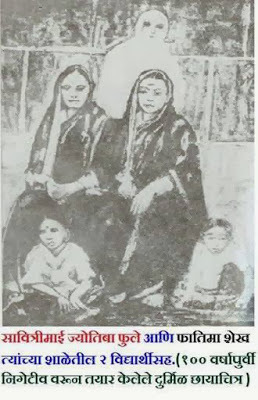 Usman Sheikh, the brother of Fatima Sheikh, was also inspired by the movement of Jyotiba and Savitribai Phule. According to archives from that period, it was Usman Sheikh who encouraged her sister Fatima to spread the education in the society. When Fatima and Savitribai started going to schools which were established by Jyotiba, people from upper caste community used to harass them and abuse them. They were stone pelted and sometimes cow dung was thrown at them as it was unimaginable for the upper-caste community to see lower castes of the society getting educated. Fatima and Savitribai didn’t pay attention to these hindrances and continued their work. The journey was even tougher for Fatima Sheikh, as she was opposed by both the Hindu as well as Muslim community both for what she was doing. However, as we now know, she never gave up and continued to go door to door, encouraging families and parents especially those from the Muslim community. As several writings say, Fatima used to spent hours counselling parents who did not wish to send their girls to schools. Fatima Sheikh is now widely regarded as the first Muslim woman teacher of the 19th century and it is a badge which Indian Muslim community wears with pride. Although there isn’t much literature available over the lives and works of Fatima Sheikh, there have been attempts made by the government to acknowledge her role. In 2014, Fatima Sheikh’s brief profile was included in the school Urdu textbooks of Bal Bharati Maharashtra State Bureau along with the likes of Sir Syed Ahmad Khan, Zakir Hussain, Abul Kalam Azad. Although some from the Maratha community objected to the same, it goes without saying that she was a Marathi too, as she was born in the region and propagated the idea of education in the same region. The friendship between Fatima and Savitri was one of respect, compassion and synergy. Throughout their time together, Savitri would often mention her in her letters to Jyotirao with affection and concern. Their friendship lives today in the form of the work they have done in creating both foundation will and actual structures for uplifting of the marginalized.